Chilean wine enjoys a good reputation with sommeliers all around the world, with its popularity soaring in the last decade. Central Chile's Mediterranean climate is ideal for vineyards, and some of the best wine comes from the Central Valley, around Santiago. Wine tastings are a popular activity in Santiago, and there are many wineries to choose from. Valle de Maipo, Valle de Casablanca and Valle de San Antonio are the closest to the city, and there are nearly 30 wineries in Valle de Maipo alone. Wine country in Chile stretches for many miles along the coast, from Valle de Elqui in the north to Valle de Malleco in the south. Chilean wine country is an especially beautiful region in the summer, and a great way to explore the area is on bicycles which can easily be hired in nearby towns. 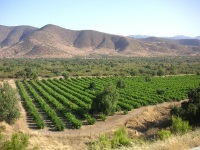 Some groups of wineries have banded together to offer established tours along 'wine routes', of which the circuit of the Colchagua Valley is the most popular. Many tour operators in Santiago offer wine tasting packages as well. There is much to delight sommeliers in the region but it is also a fun experience for the uninitiated.